Where I Got It: The awesome people at Book Riot sent me a copy to review. First I need to give a bit of background on this book so you all understand why it is so awesome. The fantastic people over at BookRiot.com came up with the idea of using Kickstarter to fund a book that helped readers ease their way into reading some traditionally formidable authors. Readers contributed thousands of dollars to the project. So, it's the readers who made this book possible. The result is a fantastic volume that I am so happy to have the chance to review. And am happy to know it out there in the ether, available for anyone. The various contributors to BookRiot, many of whom have their own fantastic blogs, wrote brief essays that introduce the author and why they are seen as challenging, why they are worth giving a chance, and they give three or four books that give you a good taste of the author and (hopefully) entice you to read more. The sequence guides you through the author's works so that you get acquainted, a bit more familiar, then finally dive in the deep end, fully immersing yourself in their most iconic work. The contributors all write in their typical fun and light, but still totally intelligent tone as they walk you through the likes of Charles Dickens and Ernest Hemingway, and more contemporary writers like John Irving and Stephen King. You get a sampling of twenty-five fantastic authors from classics to contemporary to comics. My reaction--Upon receiving my review copy, I just had to flip through every author and see what books were recommended. That curiosity satisfied, I went through more slowly and thoroughly read the essays in the book. My interest has been piqued on so many authors! On the authors I have read, I could see the wisdom in the argument. 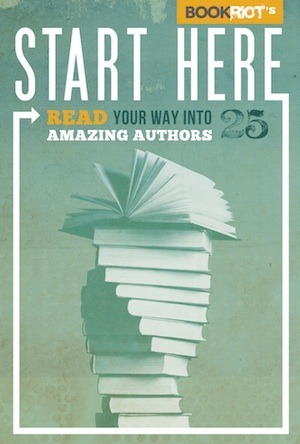 I was familiar with the writing style of a couple of the contributors before reading Start Here, but I was so happy to see that all of the contributors were clear, concise, and very accessible as they sold you on a book or an author. It was nice to feel like I was having a short conversation with someone like me, someone who enjoys good books, as opposed to having some stuffy old, out-of-touch scholar pontificate at me on the merits of certain books. Currently (I believe) Start Here is only available in digital format. And the book only costs $2.99, so it's totally a steal. Buy it. Support BookRiot. (I was not paid, or asked to say that; I just really enjoy their website for book articles) And maybehopefullypleasepleaseplease they'll come out with another volume with different authors. I hope.